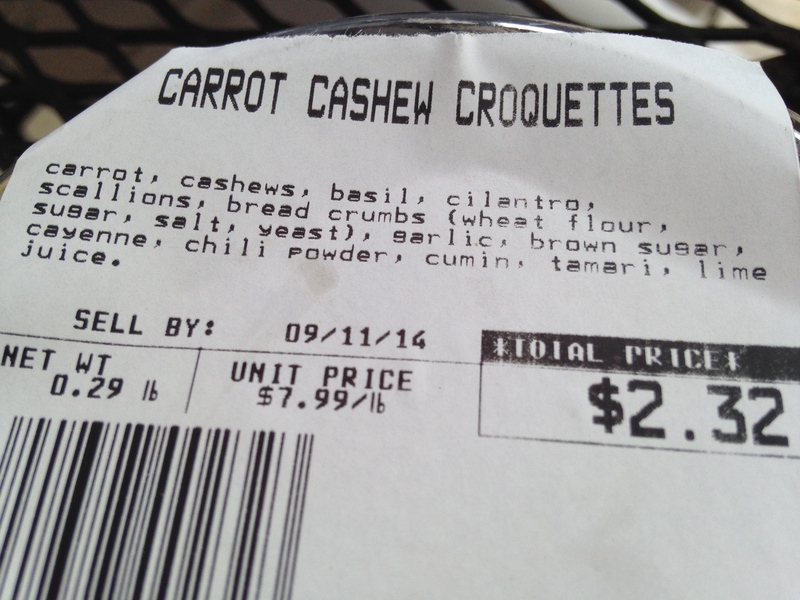 And speaking of our trip to North Carolina in September…Remember how I raved about these carrot cashew croquettes from Whole Foods/Greenlife Grocer? Well, I figured them out in my kitchen and they are fully in the regular rotation. I tinkered with the ingredient list and figured these proportions based on other burgers and croquettes I make. I also omitted the basil and swapped in quinoa flakes for the bread crumbs to make it gluten-free. The man behind the counter gave me a great tip. He said that the key to making a great veggie burger or croquette is to pan fry them until both sides are browned and then let them rest before baking them in the oven for a crispy outside and full flavor integration on the inside. Thanks dude! Dice the carrots and slice the scallions or chop the onions. Water or oil sauté the carrots and onions until just softening. Add a pinch of salt. Chop up the garlic clove and add it to the sauté pan for a minute or two. Place the cashews into the food processor. Add the parsley, cilantro, quinoa flakes, maple sugar, tamari, lime juice, cumin, chili powder and cayenne pepper. Pulse a few times to get the mixture chopped a bit. Pour the carrot mixture into the processor and process until everything is well ground up. Let cool for a few minutes. Line a baking sheet with parchment paper. I use my 1/3 cup measuring cup to form 4 croquettes. Heat oil in a skillet and pan fry until both sides are browned. Place on the baking sheet and let cool. When ready to eat, bake in a 350 oven for 30 minutes. Freeze leftovers. Enjoy! I live in Asheville and they never have these at Greenlife anymore, so I asked for the recipe and they didn’t know where that was, but did give me the ingredients list as you have. I haven’t tried to make my own version, but thanks for yours….I’ll try that first and love the quinoa flakes instead of breadcrumbs. let me know how it goes and if you ever get the recipe, please pass it along!